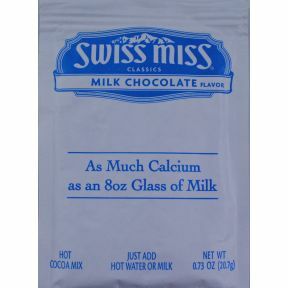 .73 oz milk chocolate flavor hot cocoa beverage mix in individual size packet. A convenient travel size for on the go. Ingredients: sugar, corn syrup, modified whey, cocoa (processed with alkali), hydrogenated cocnut oil, nonfat milk, calcium carbonate, less than 2% of: salt, dipotassium phosphate, mono- and diglyderides, artificial flavor. Contains milk. Special Offer 5% off this item when you buy 10 or more. Enter coupon code SWISSMISS at checkout to receive discount.